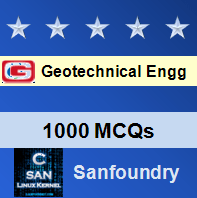 This set of Geotechnical Engineering Multiple Choice Questions & Answers (MCQs) focuses on “Effect of water table on bearing capacity”. Explanation: When the water table is above the base of the footing, the submerged weight ‘γ’ should be used for the soil below the water table for computing the effective pressure or the surcharge. 2. Which of the following is an essential difference between Vesic’s and Hansen’s procedure? Explanation: The essential difference in Vesic’s and Hansen’s procedure are i) use of slightly different values of Ny and ii) a variation on some of Hansen’s inclination, base and ground factors. Explanation: The two equations Nc = (Nq – 1) cot φ and Nq = tan2 (45 + φ/2) ex tan φ have been adopted by i) Terzaghi and Peck ii) Hansen iii) Vesic iv) Meyerhof and Bureau of Indian standards. 4. Which of the following N factors has the widest range of values? Explanation: The Nγ factor has the widest suggested range of any value of N factors. A literature value reveals that for φ = 40°, 38≤ Nγ≤192. 5. Which of the following term does not contribute to q f? Explanation: The Nγ term does not contribute significantly to qf so that almost any reasonable value can be used. Bureau of Indian standards (BIS) recommends using the value of Nγ, given by Vesic. Explanation: M Meyerhof’s extended the analysis of plastic equilibrium of a surface footing to Shallow and Deep foundation according to both Terzaghi and Meyerhof analysis. 7. In the Bowl’s method for finding the effect of water table, which of the following factor is used for soil in the wedge zone? Explanation: In the third method (Bowles, 1988), no water reduction factor is used, but effective unit weight (γe) is used for the soil in the wedge zone. 8. Which of the following equation has been recommended by Indian standard for finding reduction factor in water table? Explanation: Rw =Rw2 = 5 (1 + z w2 / B) has been recommended by Indian standard at a depth D1 below the ground level. 9. The value of Nc and Nq are same for, which of the following methods? Explanation: The value of Nc and Nq are same for Meyerhof, Hansen and Vesic method, while subscripts for Nγ identify the author, i.e. N γ(H) = valued by Hansen etc. 10. The factor N γ(M) identifies which of the following author? Explanation: The factor N γ(M) gives values by Meyerhof, as it has the subscript (M) in it.